Republicans pushed a bill approving the Keystone XL oil pipeline though a key Senate committee, but President Barack Obama’s promise to veto, along with a Nebraska court ruling, could delay its construction for months – if not indefinitely. A bill approving the construction of the Keystone XL oil pipeline passed the Senate Energy and Natural Resources Committee by a 13-9 vote, marking the bill for a floor vote as soon as next week. A lone Democrat on the committee, Joe Manchin (D- W. Va.), supported the measure, while the others voted against it. Following the committee vote, Democrats blocked plans for immediate debate in the Senate. Senate Majority Leader Mitch McConnell (R-Ky.) said that taking up the pipeline bill will be the chamber’s first order of business this year, now that it is controlled by Republicans. Democrats may have delayed a floor vote on Thursday after the bill passed the Energy and Natural Resources Committee, but there will be a test vote held early next week. The House of Representatives, meanwhile, will vote on its version of the bill on Friday. The legislation is likely to pass the Senate next week, as Republicans likely have enough support to overcome a filibuster, with 54 Republicans and six Democrats. However, they don’t have enough support to override a veto, should President Obama carry out that threat as promised. Yet even if they bypassed the president’s objections, construction could potentially be held up for years to come if Nebraska delays approval of the project. The state has yet to sign off on the pipeline’s route in a case that is before the Nebraska Supreme Court. The court is considering whether the Nebraska Public Service Commission must review the pipeline before it can cross the state. The state’s governor, Dave Heineman, gave the project the green light in 2013 without involving the panel. The $8 billion pipeline would carry oil from Canada through Montana and South Dakota to Nebraska, where it would connect with existing pipelines to carry more than 800,000 barrels of crude oil a day to refineries along the Texas Gulf Coast – a distance of 1,179 miles. Six years ago, there was little opposition to the plan, but a massive oil spoil in the Gulf of Mexico happened in 2010, followed by another spill in the Kalamazoo River in Michigan. Those events rattled landowners and lawmakers, particularly in Nebraska, who grew concerned over what a spill could do to the local Ogallala aquifer, which supplies drinking water to about two million people in eight states, and supports irrigation. Nebraska justices have not indicated when they would make a decision, but court rulings are handed down on Fridays. Regardless, months or years could pass before construction could begin in the state. 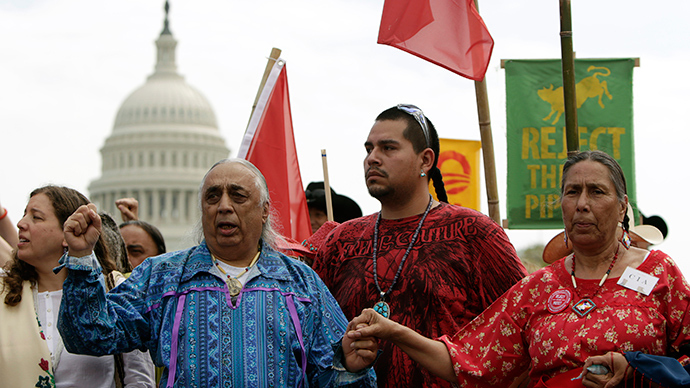 The project will still require a permit from the president for the pipeline to cross into the US from Canada. And there are still other objections to the project; a federal lawsuit has been filed on behalf of Native American tribes in Nebraska and South Dakota over the possible disruption of sacred lands that would occur during construction. There are also environmental concerns over oil spills and threats to watersheds, but economic benefits have also been projected to be small. The pipeline has been touted as generating jobs, but according to a report issued by the State Department, at most there would be 42,000 direct and indirect jobs created during the span of its construction, estimated to last two years. Of those, only 3,900 would be construction jobs in the first year, and that would go down to 1,950 in the second. Long-term, only 50 jobs would be available during normal operation: 35 permanent and 15 temporary. President Obama has stated his opinion several times about the project, saying it would “not even have a nominal benefit” to American consumers.